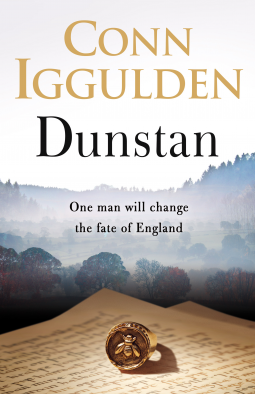 History has always fascinated me, but I don’t know very much about the medieval period, so I was keen to read Dunstan: One Man Will Change the Fate of England by Conn Iggulden, to be published on 4 May 2017. It is historical fiction following the life of Dunstan who was born some time between 910 and 920. He was the Abbot of Glastonbury, then Archbishop of Canterbury and later canonised as a saint. I thoroughly enjoyed it and learned a lot about the period. The year is 937. England is a nation divided, ruled by minor kings and Viking lords. Each vies for land and power. The Wessex king Ã†thelstan, grandson of Alfred the Great, readies himself to throw a spear into the north. Conn Iggulden has brought the period to life with this book, fleshing out the historical records. It’s written in the first person, past tense, so we see events through Dunstan’s eyes. He and his younger brother Wulfric were brought up by the monks at Glastonbury Abbey. It’s a harsh, cruel life, but Dunstan has a vision that he will build a cathedral and his ambition and determination help him to make his vision a reality. The book is set during the reigns of several kings, Ã†thelstan, the grandson of Alfred the Great, then of Ã†thelstan’s brother Edmund, who was king for just five years before he was killed. He was followed by another brother, Eadred, then by Edmund’s sons, Edwy and Edgar, who divided England between them. They were followed by Edmund’s grandson, Edward and finally by Ethelred the Unready, his much younger brother. I hope I have got the sequence correct. This was a period of great unrest and conflict, as England eventually became unified under one High King, and was attacked repeatedly by the Vikings. Dunstan was manipulative, dedicated, ruthless and proud. It was these characteristics that enabled him to succeed. He was present at the Battle of Brunanburh in 937, in which Ã†thelstan defeated an alliance of Viking and Celtic warriors for control of the country and became the first king of England. Dunstan also reformed the monasteries, imposing the rule of St Benedict, was instrumental in the building of Glastonbury Abbey, was an adviser to Eadred, exiled by Edwy, and reinstated by Edgar before being appointed Archbishop of Canterbury. My summary of this book really does not do it justice. I was fascinated by it and the detail is impressive. It incorporates many tales about Dunstan, including the one where he is said to have pulled the devil’s nose with a pair of tongs. Conn Iggulden’s version of this tale is truly horrific. His Historical Note explains his use of the sources he has used and explanations of his use of names, notes on spelling, titles, on the Battle of Brunanburh, on Gothic Arches, and on the many miracles that Dunstan is said to have performed. Where there are gaps in the historical records Iggulden has filled them in to present his story of a man who achieved so much despite his flaws and self-doubt. My thanks to NetGalley and the publishers for an advance proof copy of Dunstan. This sounds fascinating, Margaret. Another one for the list! I thought it fascinating – and hope you do when you get round to reading it. This sounds fascinating, Margaret. I love history, too, and that part of history is really is interesting. I like the idea of seeing from that different sort of viewpoint, too. Glad you enjoyed it. It was the period that grabbed me Margot, so far back in time. I’ve been watching The Last Kingdom on TV and enjoying it, this book would be a continuation of that history so I think I would find it interesting. I’ll look out for your review – hope you’ll like it too! Dunstan is not the ideal monk! I just started The Last Kingdom by Bernard Cornwell and it is fascinating, especially since at the point I’m at I’m rooting for the Danes/Vikings. This sounds like the flip side of the coin and equally as good.